For the female fighters in the UFC, 2018 was a great year. There were tons of great fights with sweet submissions and knockouts. If 2019 is anything like last year for the women in the UFC we are in for a wild and fun ride. Although there were two title changes in 2018, the Super Fight at UFC 232 in December was the big one. With a massive knockout. In the Super Fight people had been looking forward to, Bantamweight champion Amanda Nunes ended the now former Featherweight champion Cris Cyborg’s night in the first minute of the first round with a flurry of punches. With the knockout win, Nunes became a double-champion, just the third in the UFC’s history. The other title change came when the UFC forced the inaugural Flyweight champion Nicco Montano to vacate her championship. At the beginning of December, Valentina Shevchenko beat former Strawweight champion Joanna Jedrzejczyk by unanimous decision to become the UFC’s second Flyweight champion. Now the champions need to put their titles on the line in 2019. But who will they fight? And who will end the year as champion in the UFC’s four women’s divisions? Amanda Nunes is the champion in two divisions; Featherweight and Bantamweight. She is the first women to be a double champion in the UFC’s history. Although many are calling for a rematch between Nunes and former champion Cris Cyborg, there isn’t an immediate need for said rematch given Nunes ended the fight in the first minute of the first round. Featherweight is a division lacking fighters. The champion isn’t even a true Featherweight. Former champion Cris Cyborg is, but her UFC contract ends in March. So we don’t even know what will happen with Cyborg. Even if Amanda Nunes is the champion, she really doesn’t have any opponents to defend the belt. If any divisions are laughable in the UFC, it’s Featherweight. The UFC ran a tournament of Featherweights at The Ultimate Fighter season 28– Macy Chiasson won the tournament and got a UFC fight contract. But then she received her first fight at UFC 235 in March– at Bantamweight. This is the state of the UFC’s Featherweight division– not even their TUF winner wants to fight in the division. At this point, it’s probably time to scrap the division. There are only two true Featherweights under contract; Cris Cyborg and Megan Anderson. Cyborg’s contract ends in March. Maybe it’s time to part ways with Cyborg and Anderson and let them go to another promotion where they can and will have far more opportunity. Cris Cyborg will always be known for being the first UFC Featherweight champion, Amanda Nunes should be the last. The two-division champion Amanda Nunes‘ real weight class is Bantamweight. After beating former champion Miesha Tate at UFC 200 in 2016, Nunes has defended her belt three times, twice ending it by fist punching. 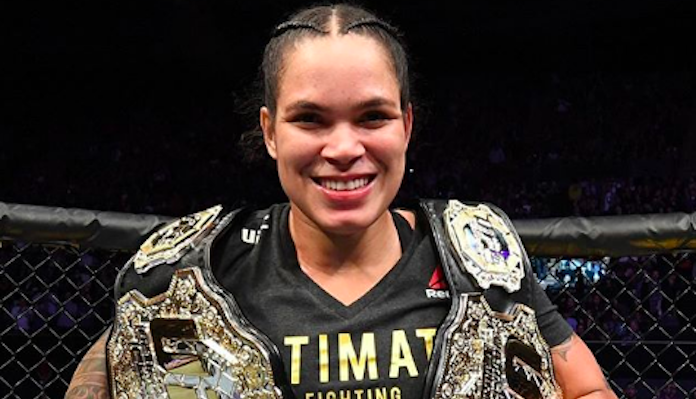 In 2019, Amanda Nunes should defend her Bantamweight strap at least once. But who will she face and will she end 2019 as the champion? At just 23 years young, Aspen Ladd is the future of the Bantamweight division. She has had issues with making weight but in her two UFC fights Ladd has finished her opponents via vicious punches in the first and second rounds. Before a shot at Amanda Nunes and the title, Ladd is set to face former champion Holly Holm in Match at UFC 235. Although Ladd has fought good opponents, she has never had an opponent with the striking Holm has. When talking about the best female strikers in MMA, Holly Holm should always be mentioned. Her striking game is on another level. The next opponent of Amanda Nunes should be the winner of the Holm-Ladd fight. Amanda Nunes is as dominant of a champion as any other in the UFC. She is literally the best female MMA of all time. Will she lose her title in 2019? Odds are in her favor. It could happen, but she will most likely still be holding a minimum of one title going into 2020. Going into 2019, Valentina Shevchenko is the Flyweight champion. She won the championship at UFC 231 in December by beating former Strawweight champion Joanna Jedrzejczyk by unanimous decision. Now she needs an opponent for her first title defense. With three wins in 2018, Jessica Eye is the number one contender to the championship going into 2019. She is coming off of a win against Katlyn Chookagian at UFC 231. Now, Eye deserves a title shot. Although Eye will probably be a heavy underdog going into the fight, she does pose a threat on the feet with the counterpunching champion. Eye might not win the fight but she will show up for and deliver a fun performance that might get people’s attention. If Jessica Eye doesn’t beat Valentina Shevchenko, will anyone in 2019? Are there any true threats to the belt? The first champion and one who is forgotten, Nicco Montano, will eventually take a fight. It should be for the belt – it’s the least the UFC can do for the woman they stripped. Montano poses trouble for Shevchenko, especially on the feet. If it’s a standup battle, Shevchenko could very well lose. When and if 2019 gives us the Shevchenko-Montano battle, we will have a new champion. If not, Shevchenko goes into 2020 with the strap. The Strawweight division is one of the deepest in the UFC. There are fighters who can be called contenders throughout the top-15. Champion Rose Namajunas has her hands full when she defends her title against number one contender Jessica Andrade at UFC 237 in May. Not only is Namajunas making her return to the Octagon after an over a year away from fighting, but she will be going into the home country, Brazil, of her opponent. This title defense will not be an easy one, Andrade poses a legit threat to dethroning the Strawweight queen. Andrade is as vicious as they come, she never lets up. But neither does the champion. Both women have a ton of heart and skill – this will be an epic battle. Whomever comes out of the fight between Namajunas and Andrade as champion will have opponents lining up for their shot. The first in line to get a title shot should be Tatiana Suarez. With a huge win over former champion Carla Esparza in September Suarez showed exactly why she is a legit threat to the champion. Suarez might be the toughest opponent for anyone in the Strawweight division given her wrestling skills are top-notch. Once she gets ahold of her opponent and forces her will onto them along with a vicious ground-and-pound game it’s virtually a wrap. Suarez is the real deal. Whether Rose or Jessica is the champion after UFC 237, they will have to fight Tatiana Suarez at some point in 2019. Suarez has the potential to be a champion and will probably one day be one. Will 2019 be the year Tatiana Suarez gets a title shot? Hopefully. Will she win if she gets the title shot? Possibly. All three women; champion Rose Namajunas, Jessica Andrade and Tatiana Suarez have what it takes to be a longtime champion of the Strawweight division, 2019 will be a fun one for these ladies and the division as a whole. My, Stephen; you are really going out on a limb claiming Montano would defeat Shevchenko. Just curious as to what you’re basing this opinion on. Fiiiiiiiiiiiiiinally , someone besides me knows what’s up, JR !! Stephen is ON POINT !! Just hope Nicco comes back !! Agree with the article other than I don’t see Nicco being any kind of threat to the Bullet. Sorry, but no one at Flyweight is beating Valentina anytime soon, especially not Montano; who will probably get cut as soon as she losses one fight… If she even gets to fight again. The only other lady who could have a competitive fight with Valentina, is her own sister and they won’t fight. So bring on Eye, and then Carmuche if she beats Pudilova. Cris should go to Bellator or somewhere else, Featherweight would probably see a rise in population if she leaves. Especially if Amanda vacates the title, opening up the possibility for other ladies to duke it out without having to worry about Cyborg down the line. Nunes should fight the winner of Ladd/Holm, yes. But for some reason, Germaine DeRandamie is ranked #1, but I doubt she’s getting a title fight unless she beats half the roster first. Rose is done for, her fragile self will have trouble fighting Andrade, Suarez, and probably Zhang down the line. If a title will change hands for sure, it’ll be Strawweight. Nicco will beat Shevchenko if they ever get to fight. Eye will also beat Shevchenko. Shevchenko’s sis would get obliterated by Valentina in an MMA fight! Are you freaking kidding me??! Let’s see if sis can even beat someone in the top 10 first, or even top 15. Give her winner of PVZ and Ostovich, ha ha! And Zhang! She’s good, but she won’t get past Tiny Tornado!